After much ado — that is, after weeks of battling off the crazed, fried-grits-eating hordes trying to climb over the barbed wire around our highly-secure #gamedev complex, trying to get their hands on an alpha version of our game — after months of 3 a.m. pushes to get just one more feature completed — after years of living small in an apartment not much bigger than a refrigerator box — GRITS Racing is finally seeing an early-access launch at an early-access price. The current alpha version is very solid on the core game mechanics. It is light, however, on content, animation, sound FX, and other polish. Namely, only 4 of the planned 24 tracks are built thus far (fan art will be considered to help this along — contact us for details). It is also light on single-player features at the moment. Namely, the AI cars and the leaderboards are lacking on that front. The plan is to build GRITS Racing into a solid, medium-sized indie game worth about twice the current price, and to launch on consoles as well. How quickly any of that happens will depend on interest in the game from the fans. If Matt can continue working full time on the game... he will. (Same as he has been for the last year and a half.) Ideally, version 1.0 might be ready for launch in 12 months or less. More likely, however, Matt will need to halt progress here and there to find other income, and this, of course, will slow progress. 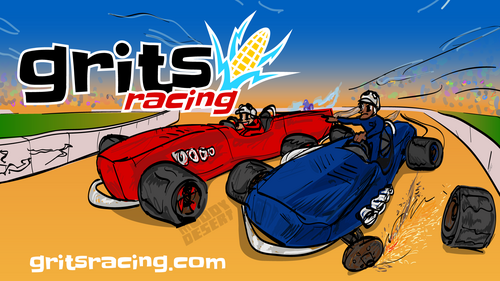 Thus, we shall see, and will continue to hope for the best progress on GRITS Racing. Thank you for reading about our ambitious launch. Now, if you will, grab some friends and frenemies, a fistful of gamepads, and take GRITS Racing for a spin (either the free demo or the early-access version).